Swipe has launched their latest tablet, the Swipe X703, in India today. The device runs on Android Lollipop. The battery capacity of the tablet is 6,000 mAh, which is justifiable given the modern day smartphones that boast of an approx. 5,000 mAh juice pack. Swipe X703 is powered by 1 GB RAM and 1.3 GHz quad-core Mediatek MTK8321 processor and comes with an inbuilt storage of 8 GB. It supports expandable memory up to 32 GB via a microSD card. It supports 3G, along with the usual connectivity features like WiFi and Bluetooth. 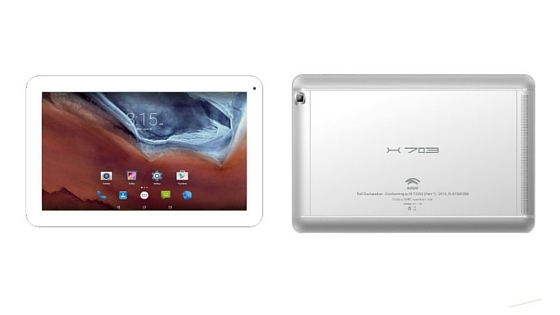 It is a dual SIM tablet; both the slots are mini SIM. The device comes with a 10.1-inch HD IPS display, with a resolution of 1280x800 pixels, and a pixel resolution of 160 ppi. The device features a 5 MP primary camera with flash. The secondary camera is a 2 MP shooter. Swipe X703 comes in white color. It is priced at ₹7,499 ($110 approx.). It is available exclusively on Snapdeal.